Discussion in connection with issues facing Maine voters and particularly voters in Orrington and Bucksport – Maine House District # 130. Please share your ideas. The majority of Mainers are supporting Home Care for All. Take a moment and watch this 2 minute story about Skip. We are all going to face home health care issues in our own lives or a family member of friend. Now is the time to establish the programs to allow disabled and elderly individuals to remain at home with dignity and respect. This is not a hand out. This is respecting and supporting all of us. An other-than-dishonorably discharged resident Maine veteran who served during wartime and is 62 years or older; or, is receiving 100% VA disability; or, became 100% disabled while serving, is eligible for a $6,000 property tax exemption. Un-remarried surviving spouses are also eligible. Paraplegic veterans, and their qualifying spouses are eligible for up to a $50,000 property tax exemption. State Employment preference points shall be added to passing examination scores for state employment. Honorably discharged veterans get a 5 point preference, 10 percent or greater disabled veterans get a 10 point preference. Spouses may be eligible as well. Maine offers a 100 percent waiver of tuition and all fees at state schools for dependents of Maine veterans who are permanently and totally disabled, died of a service connected disability, or was killed in action. Spouses have 10 years from the date of first entrance to complete the program, children have 6 academic years from the date of first entrance to complete 8 semesters. A disabled veteran who has a service connected disability evaluated at 50% or more may obtain a complimentary license to fish, trap, hunt, including archery, muzzle load, bear, migratory bird, pheasant, spring/fall wild turkey, coyote night hunt, crossbow, one expanded archery antler less deer permit, and upon meeting the qualifications, a license to guide. This license is available to residents of Maine, New Hampshire, and Vermont. This license(s) remains valid for the life of the license holder, as long as the license holder continues to satisfy the residency requirements. Any Maine veteran with an other-than-dishonorable discharge gets free admission to all of Maine’s state parks and historic sites. Maine residents who are enlisted active duty members and their dependents also receive free admission to state parks and historic sites. Active duty Maine residents, and their dependents, can buy a discounted hunting, fishing, or combination hunting and fishing license. Any military member stationed in Maine, as well as their dependents, can pay the resident fee for a hunting, fishing, or trapping license. The Maine Veterans’ Memorial Cemetery System consists of four cemeteries. One of which is located in Caribou, two in Augusta and one in Springvale. Burial is free of charge to veterans with an other-than-dishonorable discharge as well as their dependents. Visit the Maine Bureau of Veterans’ Services website for more information on any of these programs. Delegates heard compelling speeches by Democratic candidates for Governor and the Second Congressional District, as well as many others. At the conclusion of the convention, Democrats went home from Lewiston fired up to elect Democrats this November. During the Platform Committee process prior to the Convention, the existing plank opposing the private East West Corridor was dropped. After a vote of our members at a county committee meeting, we managed to get the plank back on the agenda. At the convention, Hancock County got this matter addressed as the first item considered on the floor of the convention. We made the case with help from the Piscataquis County Democratic Committee. We explained that we are not opposing progress or public transportation projects to benefit Mainers. We are opposing a private, corporate boondoogle intended to benefit Canadians at the expense of Maine’s environment and economy. We explained that the Sierra Club, the Natural Resources Council of Maine and the Maine Small Business Coalition are with us on this issue. WE WON THE VOTE ON THE FLOOR. Thank you, HCDC members, who supported our efforts! Hancock County delegates at the State Convention elected new members to the State Committee. These members will serve until the next State Convention in 2020. Single payer refers to the method of financing health care in Maine. In a single payer system, health care is funded by the public whose money is managed by the state government or governmental agency. It is not Socialized Medicine. Unlike “socialized medicine,” the delivery of health care in a single payer system is handled by the same private health care providers that we use now. The Federal Medicare system uses this model, as do most developed countries around the world. Single payer is efficient. Doctors and hospitals deal with one payment entity, rather than with a multitude of insurance companies thereby eliminating much of the current administrative burden and cost. Single payer is fair. The funding for health care is raised through taxes, which are set according to our ability to pay. Single payer controls costs. A public process determines the level of health spending, and providers are reimbursed at uniform, negotiated rates. This would be similar to the way pubilc utilities are regulated. Single payer allows your choice of doctor and hospital. Single payer savings are used to provide health care to all people as a human right. Patients no longer have to worry if they will be able to afford health care. Preventative care will reduce hospitalizations and emergency room visits. Single payer financing in Maine would preserve our health delivery system, which is known for high quality. Federal support for Medicare, Medicaid, and the Veterans Administration would continue. Single payer assures adequate funding for rural hospitals. State revenues derived from taxes would replace private insurance premiums. Corporate “stakeholders” would no longer be able to take enormous profits from the financing of health care, in the process bankrupting individuals, and draining the economy. Single payer would put health care financing where it belongs—in the hands of the people, and our democratically elected representatives. Democratic platform position: Supports responsible gun ownership in accordance with the 2nd amendment of the U.S.
Constitution and works to strengthen background checks for every firearm sale or transfer within the State of Maine. My Position: I’m generally not in favor of regulations that limit an individual’s right to live free of unnecessary intrusion. That being said, we have a huge issue surrounding violence on a mass scale that we’ve not experienced in the past. To address the extreme violence means addressing a complex web of issues. I support measures that will to thwart this escalating violence without diminishing the rights of responsible gun owners. Specific points in this platform will be addressed in separate posts on this site. Please join the discussion. Democracy needs participation to function properly. Our American democracy is a powerful and effective form of organization that strives to treat all with dignity and without discrimination, and functions for the betterment of the collective good. Maine Democrats believe that the foundation of a strong democracy is an educated and informed electorate. We believe that Americans have the right and an obligation to collectively set the political agenda and to debate and decide on those issues important to them. We have long fought and will continue to fight for these policies and principles. We adopt this platform as an expression of what Democrats in Maine support and as a guideline for elected officials in their political work. We Democrats support a fair economic deal for all and a fiscally responsible government that will protect the interests of our State and its people. Our government must uphold the right of everyone to earn equitable rewards for contributions to our economy, which will help reverse the alarming trend of growing economic inequality. Maine needs jobs with livable wages for all who can work, with a minimum wage high enough to raise workers out of poverty. To protect our most vulnerable citizens, the Democratic Party commits itself to reconstructing the social safety net. An economy free from discrimination, including equal pay for equal work. Guaranteed freedom for all workers to organize unions, bargain collectively, and strike without replacement or reprisal. Opposition to the misleadingly named “Right to Work” laws. Workplaces free from health and safety hazards, discrimination, and harassment; respect for employees’ family obligations, health, and other needs; and effective monitoring and enforcement of laws protecting workers. A ​ ​paid ​family and ​medical ​leave ​program ​for ​all ​workers. A health care system with protection for all Mainers against the significant economic consequences of illness and injury. Assistance for those suffering hardship, including strong measures to fight root causes of poverty and homelessness. Protection from the economic repercussions of natural disaster including those induced by climate change. A strong unemployment compensation program. Retirement programs with realistic cost of living adjustments, rigorous regulation of all pensions, and protection of workers’ pension funds. Strengthening​ ​the Maine Public Retirement System and repealing the provisions that prevent public sector employees from collecting the Social Security benefits they earned from work in the private sector. Strengthening and expanding Social Security to make sure that everyone in this country can retire with the dignity and respect they deserve, as well as eliminating the income cap on Social Security taxes. Giving priority to pension obligations at full value in corporate bankruptcy settlements. Regulations that support the existence of Maine’s small farms, fisheries, and other small businesses. Promotion of Maine as a leader in organic farming, as well as sustainable and best practice farming and fishing, “farm/boat to table” initiatives, demonstrable policies to encourage and support fishermen and small farmers, and immigration into Maine of future farmers. Increased capital, technical assistance, distribution systems, and markets, especially for small and mid-sized farms. A strong commitment to democratic control over economic regulation and consumer protection. Maine-owned and operated businesses with regulations that are fair for both small and large businesses in all economic sectors and support for Maine entrepreneurs through innovation centers and business incubators. Open and affordable statewide access, particularly in rural areas​, ​to broadband and cellular technology, as well as​ ​the assurance of net neutrality. Active recruiting of diverse high technology and biotechnology research laboratories and cutting-edge manufacturing facilities. Development of worker-owned businesses and cooperatives. Strong consumer protection, including protection from predatory practices in financial markets, full​ ​implementation of​ ​the Dodd-Frank Act, and reinstitution of the Glass-Steagall provisions that separated commercial from investment banking and prevented banks from gambling with customers’ money. International trade agreements that benefit the public by protecting our rights, jobs, and public health and safety. Implementation of a “Fair Chance” job application process that prohibits denial of jobs to persons based on arrest or conviction records. High quality health care, including vision, hearing, and dental care; the full range of reproductive health care, and mental health care, including treatment for substance use disorder. The right to make their own informed health care decisions, including reproductive, pro-choice, and end of life care. Access to safe and sufficient food and water, in order to guarantee proper nutrition. Support for programs that increase gun safety. Rural health clinics and hospitals with financial support sufficient to assure delivery of care to underserved areas. Government negotiation of prescription drug prices. Prohibition of television advertising of prescription drugs. Responsible, judicious prescription of all medication, testing, and treatment, combined with programs for the treatment of addiction and substance use disorder. Community support for the elderly and those with disabilities, to allow all to live as independently and work as productively as possible. Effective control of health care costs by means of an all-payer rate setting system. Spans early childhood through college and workforce training. Strengthens the development and potential of all children through quality preschool and childcare programs. Ensures that all students can choose from multiple educational pathways to graduate from high school prepared for college and/or career. Efficiently and effectively develop​s​ community members who are well educated and capable of participating successfully in our economy and democracy. Ensures that all students have teachers and other educational personnel who are well trained, equipped, and supported. Guarantees that parents and guardians have opportunities and the support needed to engage in their children’s education. Promotes the core values for Maine which are respect, honesty, compassion, fairness, responsibility and courage. Supports strategic investments in preschool through grade twelve programs, accredited public and private universities, community colleges, apprenticeships, and workforce training programs that offer expanded job opportunities. Honors the 2003 citizen-mandated state budgetary commitment to pay 55% of all public school education costs. Believes the state has a primary role in subsidizing the cost of higher education and must address the high cost of higher education through better need-based financial aid. Supports coordinated efforts to provide students and workers with the skills needed to match current and future private and public employer needs. Takes measures to alleviate the burden of excessive student loan debt. Views the U.S. and Maine Constitutions as living documents. Maintains the integrity of the U.S. and Maine Constitutions and laws by strengthening separation of powers and requiring executive, legislative, and judicial accountability. Upholds the will of the people as expressed through citizen initiatives and referendums. Relies on decision-making processes that are based on the best available evidence and facts. Enacts​ ​a state constitutional amendment that provides a procedure by which voters can remove a governor from office. Implements​ ​ranked choice voting and a nonpartisan redistricting process in order to ensure elected officials are truly representative of their constituents. Makes the process of voting transparent and fraud-proof by putting all aspects of it under public control, including the use of open-source ballot-handling software, paper ballots, and an effective auditing process. Refrains from censorship and control of the media, while supporting non-profit and publicly funded media sources to ensure expression of a broad range of ideas. Calls for the people of the State of Maine and all branches and administrative divisions of state and local government to recognize and respect the sovereignty and self-determination of all Native American tribes located in the state. Opposes the legal concepts of corporate personhood and money as speech as they apply to the political process. 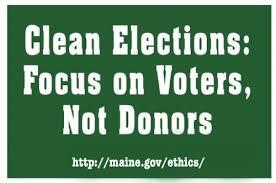 Upholds and strengthens the continued integrity of the Maine Clean Elections Act. Promotes reforms for increased disclosure and transparency​ ​of lobbying activity and increases the public’s ability to influence laws and rules. Opposes contracting the jobs of public employees to private entities or profit-making agencies. Places a priority on alternative processes for peaceful resolution of conflict. Promotes the use of restorative justice and proven alternatives to incarceration, protects the community, reduces crime, and eliminates harsh and permanent punishment including the death penalty. Immediately addresses drug use and addiction as a public health crisis. Makes needed public investments in and actively works with the Federal Government to develop Maine’s transportation, energy, and communication infrastructure. Limits land-taking by eminent domain to government entities, exclusively for projects directly benefiting the public and not for private gain. Strengthens regulations to protect citizens and consumers. Enacts fair compensation for state legislators and provides the tools and resources they need to perform their work. Upholds a strong, clearly defined, and transparently enforced code of ethics that holds legislators, the governor, and constitutional and statutory officers to a high standard of behavior while in office. Favors an increase in the allowable number of terms for state legislators. Promotes enforcement of laws and equal protection for men, women, and children against domestic and sexual violence. Authorizes the legal sale of marijuana for adults 21 years and older. Protects the medical use of marijuana. Considers internet access as a right and as a public utility, promotes municipal high speed broadband networks across the state, and supports net neutrality under the jurisdiction of the FCC. Promotes true democracy by guaranteeing barrier-free access to the vote, acting to expand voter access, ensuring that all legal votes are counted, opposing policies that would suppress voter turnout, and promoting and enforcing laws against intimidating or coercing voters or restricting the right to vote. Upholds​ ​the Constitution and individual liberties, especially its guarantees of free speech, free exercise of religion, separation of church and state, and freedom from all forms of discrimination. Endorses the rights to food, water, shelter, health, and education as outlined in the Universal Declaration of Human Rights. Guarantees citizens’ rights to privacy, rejects the unauthorized collection of personal data by private or public entities, and rejects spying on citizens without individual warrants. Upholds habeas corpus for all people, rejects secret or indefinite detention, resolves to swiftly absolve those unjustly convicted and incarcerated, and provides detainees access to loved ones and​ ​adequate and competent counsel. Ensures​ ​responsible gun ownership in accordance with the 2nd Amendment of the U.S. Constitution and works to strengthen background checks for every firearm sale within the State of Maine and promotes the restoration of gun safety research.. Does not conduct, aid, or condone torture. Promotes the full participation of all persons in all of society’s activities by creating conditions that​ ​enable full and active participation of every member of the society in all aspects of life, including civic, social and economic, and participation in the decision-making processes. Promotes and enforces laws, including Affirmative Action and hate crime laws, that protect civil rights. Enforces the Americans with Disabilities Act and brings all public accommodations into full compliance, including state and federal facilities. Promotes full constitutional equality for women and men as articulated in an Equal Rights Amendment and endorses its passage and ratification, on both the state and federal levels. Continues the work of the recent Maine Wabanaki-State Child Welfare Truth and Reconciliation Commission regarding the abuse of native people, especially children, by implementing​ ​the recommendations of the Commission. Acts to dismantle institutional racism in all its forms. Respects the dignity of all immigrants, ensures their human rights, and offers a path to legal residence for long-term and otherwise law-abiding undocumented asylees, refugees, and immigrants. Enforces and sustains the laws that protect people of all marginalized orientations, gender identities, and intersex statuses, and opposes all efforts to dismantle or limit these rights. Protects employees against unfair and arbitrary dismissal. Fairly and uniformly protects injured workers for the full term of their disability. Protects the rights of injured people to file a lawsuit and/or obtain a jury trial with no statutory limits on monetary award; and opposes so called ‘tort reform’ that threatens these rights. Ensures​ ​the rights of citizens to be protected from predatory economic speculation and lending practices. ​agencies ​and ​for ​identifying ​and ​remediating ​pollution ​sources. Advocates​ ​developing renewable energy technologies and accelerating the transition from fossil fuels to green, renewable energy sources. Promotes​ ​energy-efficient transportation and a stronger public transportation system. Commits to improving energy-efficiency standards for buildings. Applies the precautionary principle that those developing, manufacturing, or selling products and technologies, as well as​ ​agencies approving them, are obligated to demonstrate their safety to public health and the environment. Ensures access to clean, safe, drinking and swimming waters, protect​s​ surface waters and aquifers, and regulates the large-scale extraction of our waters. Actively works to restore and conserve the Gulf of Maine habitat and the communities dependent on the health of that habitat, given the threats to our fisheries posed by ocean warming​,​ acidification, and sea-level rise. Works ​with ​regional ​and ​federal ​partners ​to fight airborne pollution. Defines, limits, and monitors out-of-state waste, eliminates harmful waste,​ ​prohibits improper chemical disposal, and promotes waste reduction, reuse, recycling, and composting. Manages Maine’s woodlands as a sustainable resource that sequesters carbon, while also supporting wood products industries and forest recreation and tourism industries. Strengthens laws and governmental regulatory oversight concerning the use of chemical products that are harmful to the environment and dangerous to human health. Opposes oil and gas exploration and drilling in the Gulf of Maine in order to protect our fishing and tourism industries and opposes the use of hydro fracking technology in nationwide oil and gas drilling. Opposes the private, Maine East-West Corridor. Leads by example and action to wage peace in the world; safeguards national security through peaceful solutions to international challenges; works closely with allies; strengthens the United Nations; supports international law and agreements; opposes subversion of democratically elected governments; acts to prevent genocide; and cooperates with the International Criminal Court. Advocates​ ​democratic reform and human rights, avoids support for oppressive regimes, and stands up against violations of international law throughout the world. Condemns the use of children for fighting, forced labor, and sexual servitude, including child marriage. Maintains an effective defense force that is equipped and organized to handle real foreign threats to vital U.S. interests and is​ ​complemented by an intelligence service that protects the privacy of citizens, never launches undeclared or pre-emptive wars, minimizes use of private contractors, and works to prevent civilian casualties, reduce the world arms trade, and eliminate​ ​weapons of mass destruction. Expands citizen cultural and educational exchanges with all nations and supports NGOs and universities in the developing world. Prioritizes multilateral efforts to end terrorism and those situations of inequity and injustice that help foster terrorism. Strive​s​ for peace and stability in the world through renewed emphasis on diplomacy and open communication, economic and social development, human rights, state sovereignty and self-determination, and nuclear de-escalation. Supports a mutually agreed upon two state solution between Israel and Palestine. Increases assistance​ ​for humanitarian aid​, ​refugees, disaster relief, international development, and the elimination of poverty. Leads in shaping a global economy tha​t​ favors a fairer distribution of growth and development among all peoples; respects indigenous leadership, trades, and resources; and protects the environment, labor rights (including the​ ​right to a living wage), public health, and the public good. Strengthens international financial mechanisms and regulation of international transactions and prevents currency and commodities manipulation. Promotes​ ​fair trade and opposes the “fast track” process and those current and future trade agreements that​ ​put thousands of American jobs in jeopardy. Strengthens domestic jobs, businesses, and farms; eliminates all forms of government assistance for corporations that outsource jobs and business; and reforms existing trade agreements to include enforceable protections for workers, consumers rights, and a sustainable environment. Endorses​ ​the International Violence Against Women Act and ratification of the Convention for the Elimination of all Forms of Discrimination Against Women. Honors veterans and current military personnel by proactively providing all necessary support services to them and their families. Works to have the Bureau of Veteran Services actively coordinate federal, state, and local resources, both public and private, with the commitment to end homelessness for veterans in Maine. Expands​ ​veterans’ eligibility to enroll in the Veterans Administration health care program and increases​ ​local and state efforts to help veterans adapt to civilian life with a commitment to prevent suicides among veterans in Maine. Encourages​ ​the​ ​expansion​ ​of​ ​the​ ​Co-Occurring​ ​Disorders​ ​and​ ​Veterans​ ​Court throughout​ ​the​ ​State​ ​of​ ​Maine, providing integrated treatment programs for veterans with mental health and substance use disorders who have become involved in the criminal justice system. Uses the state budget to promote sustainable economic growth, job creation, and equity in Maine. Commits to fiscal responsibility through a balanced budget as required by the Maine State Constitution. Implements a budget that reduces local government dependence on regressive property taxes by meeting the state legislative commitments to Maine communities of 5% revenue sharing and 55% state support for education funding. Opposes extra-constitutional vetoes​ ​of legislation by defunding programs in the budget. Implements​ ​a fair, progressive tax system that pays for needed public services and focuses tax responsibilities on those most able to pay. Is committed to placing a cap on property tax liability based on a family’s income. Works to reform the fiscal balance to more effectively address income inequality by making taxes more progressive and reducing budgetary reliance on regressive funding mechanisms such as the sales tax. Ensures that all government pensions are exempt from the state income tax in the same manner as Social Security income. Makes​ ​inheritance or estate taxes more progressive, fair, and appropriate. Offers tax incentive programs that are carefully considered, limited in time, and only offered in exchange for clear commitments to job creation, with repayment​ ​penalties for failure to meet commitments. Ensures adequate funding for public safety without further burdening local property taxpayers and continues to provide funding to Maine’s county jails at levels that had been previously agreed to as appropriate by the Board of Corrections. We, as Democrats of Maine, support these principles and pledge to work cooperatively with local governments, other states, nations, and parties for a better future for all of Maine’s people. Here’s a look at the Republican Party’s platform for Maine for 2018. Subsequent posts will address specific points relating to some items. in the following platform. Generations of Americans have fought to preserve the Republic, our freedoms, and the American way of life. We appreciate and honor the service of active duty and reserve military, veterans, fire fighters, police officers, sheriffs, first responders and EMTs, and all those who serve our state and nation. Today our Constitutional Republic is threatened by a failure to adhere to the principles put forth in our founding documents. It is only by restoring the principles of Liberty that we can prevent the moral and economic collapse currently unfolding. I. This platform embraces principles and identifies actions to implement them. We proclaim allegiance to the Constitutions of the United States and the State of Maine. The Constitutions, both the U.S. and State of Maine, are the framework to which all legislation must adhere. Progressive principles are incompatible with the principles of The Republican Party of the State of Maine. Affirm English as the official language of the State of Maine and the nation. Ensure the integrity of the election process. Institute zero based budgeting in all programs and require the government and all agencies adhere to the Generally Accepted Accounting Principles (GAAP). Secure the U. S. borders in accordance with current Federal law. Repeal taxpayer funding for political campaigns, requiring instead that political candidates raise campaign funds in a manner that is both voluntary and transparent. We support the Convention of States Project application which seeks to call an Article V convention limited to only proposing amendments to the U.S. Constitution that impose fiscal restraints on the federal government, limit the power and jurisdiction of the federal government, and terms of office for federal officials and members of Congress. ​For too many years, Americans have trusted that our elected officials were working to protect and defend our interests. Without persistent vigilance by the people, this trust is often misplaced. It is therefore incumbent on all of us to stay informed and involved in the American experiment of self governance. Those of us who have united behind the Republican banner invite you to join us in this task and support the Republican candidates for office that uphold these principles. Your elected state legislators are interested in your views on proposed legislation. Speaking at a public hearing is an effective way to let them know your opinion. This article explains how you can participate in the Legislature’s public hearing process.